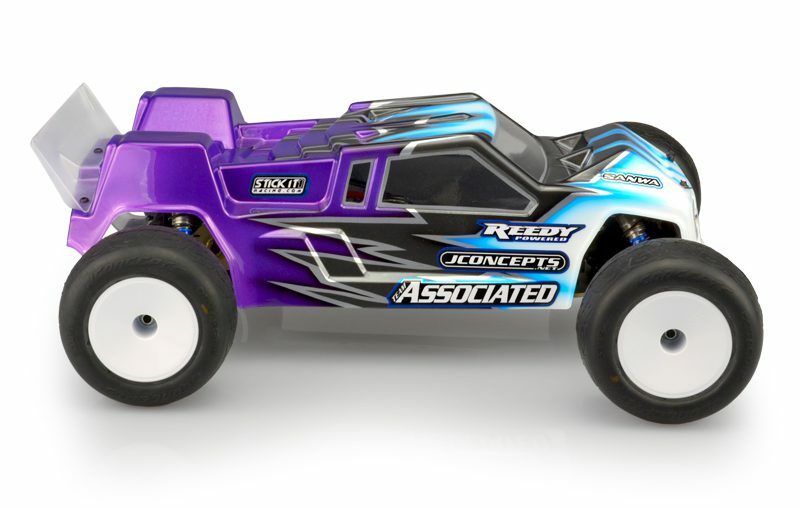 The F2 body by JConcepts has been a trend setting design since its release on the buggy population. Now, Stadium Truck racers can drop-on a race favorite design to the highly anticipated Team Associated T6.1. As they say, the slate was once again swiped clean and the F2 was a ground up form started in the computer and ultimately finished by hand. One of the key features is an arrow based design where the front is much narrower than the rear. While viewed from the top down, the F2 body has increased clearance in the front-end for tires shown to rub against the stock body during hard cornering or while running in high-traction conditions. The narrower front-end appears on-point and with an all-new grille and headlight layout with 4 included grille options. The imprint of the nose draws in the truck enthusiast without giving up on the futuristic twist and Finnisher heritage. Protecting the front shock tower area is done with a traditional shape but contains new louver positioning and available air-release features located just in front of the main cab. The cab is important, not only for performance but to set off the F2 design with angular roof and parallel window design. The popular dual side-window treatment has been once again incorporated into the design for maximum coverage. The new body includes the traditional Finnisher “V step-downs” in the bed area which makes it identifiable to the savvy racer. Rear shock tower humps allow plenty of clearance for a front or rear shock configuration which is a common adjustment on the T6.1 race truck. The tail of the body has been lowered with an upper and lower transition making the rear a more durable piece even with light-weight materials. The F2 includes two spoilers, one for high-bite conditions and another taller version for low or medium bite conditions. The spoilers are durable and with proper trimming and included hardware bolt directly to the back of the new shell.